No matter what your style, size of room, or budget, the new designs in ceiling fans offer something for everyone. Now that spring is officially here, there is no better way to embrace the warm weather than by adding a new ceiling fan to your home. This year, opt for high function and unmatched style with 2012 trends that are sure to keep you cool all summer long. According to Lynda Gould, Lamps Plus design expert and Corporate Interior Design Manager, quality is key when choosing a new ceiling fan. Here are some helpful hints for selecting the right fan from Lynda and the other experts at Lamps Plus. It is no secret that consumers are trading in their large, suburban homes for trendy urban lofts, condos, and apartments. Gould says that “With this shift toward small-space living, there has been a surge in the number of fan designs that cater to this type of room space.“ She suggests using hugger and low profile ceiling fans for smaller living spaces. “These styles have a smaller blade span and don’t hang very far from the ceiling, making them ideal for small rooms or rooms with low ceilings,” notes Gould. Conserving energy is always a stylish option, especially during those hot summer months when cooling and water bills tend to spike. There are a number of chic energy efficient ceiling fans to help minimize your impact on the environment (and your wallet!) “Look for Energy Star rated ceiling fans or designs with good airflow efficiency ratings,” says Marcia Prentice, interior designer and design blogger for the Lamps Plus Style Illuminated blog. Why limit yourself to enjoying a cool breeze only when you are indoors? Nowadays, there are hundreds of stylish options for outdoor ceiling fans that provide just the right amount of air flow on days when you feel like stepping out to enjoy the warm weather. Many factors contribute to the overall quality of a ceiling fan, but none more so than the motor. Many motors are undersized for the job or poorly constructed which not only can make your fan less efficient, but may also be the root of unpleasant humming and clicking sounds. A precision die-cast aluminum motor offers a long lifespan, superior air movement, and is extremely quiet due to the lower operating temperatures and aluminum body enclosure. Generally speaking, the greater the angle, or pitch of the blade, the more air the fan will move. Blade pitches between 12 and 16 degrees offer good, efficient airflow. 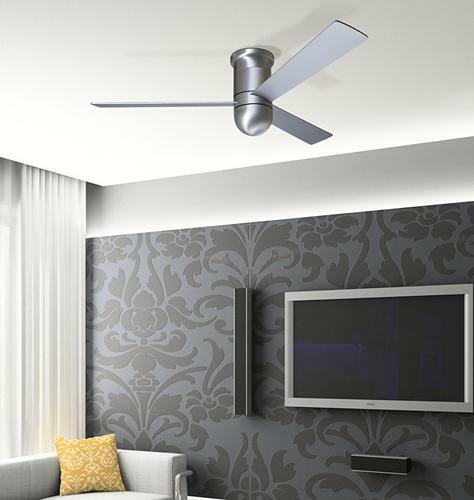 The combination of a heavy duty motor and high blade pitch makes for an efficient and well-engineered fan. 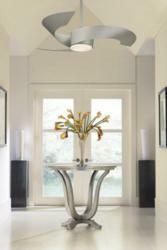 You should also consider the blade span when choosing a ceiling fan. 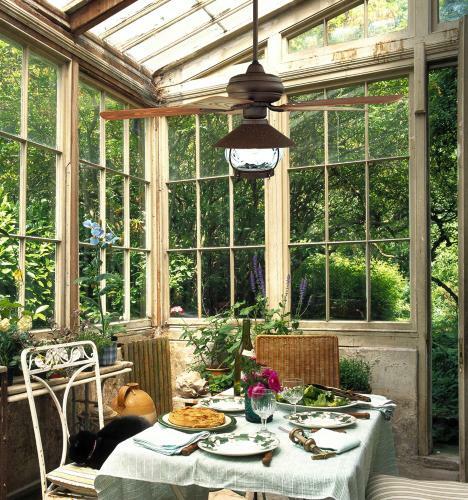 Simply opt for a larger blade span when cooling a larger space, and a smaller blade span for smaller spaces. Blades should be made of multiple layers of pressurized hardwood to eliminate warping. While this may be the last thing you think of when buying a ceiling fan, the correct remote control unit makes the operation of your fan much more convenient. Controls are classified as basic pull chain, hand held remote control, or wall control. If your ceiling fan is going to be installed in a bedroom, a hand held remote control lets you make the adjustments without having to get up. In other rooms, either a wall or remote control will keep you from having to reach for the fan every time you need to make an adjustment. This is especially worth noting if your fan is centered over a table or other furniture. For more fan inspiration, browse the Lamps Plus lighting and decor picture gallery. For over 30 years Lamps Plus has been synonymous with excellence in the lighting retail industry. Established in 1976, Lamps Plus is the nation's largest specialty lighting company, with over 40 superstores throughout the western United States. Together with their retail stores and online business, the company serves over five million customers each year with the largest selection of functional and decorative lighting fixtures, ceiling fans, furniture, and home decor. This selection includes hundreds of products available exclusively from Lamps Plus. Services include free in-home lighting consultations, in-store lighting seminars and installation from expert, licensed electricians. American Lighting Association certified lighting designers are available to offer product recommendations and advice in all our stores, by phone or online at LampsPlus.com. Please contact PR(at)LampsPlus(dot)com for more information.